The American Health Care Act, which repeals and replaces portions of Obamacare, cleared its second committee Thursday afternoon despite some Senate Republicans vowing they will reject it. The House Energy and Commerce Committee cleared the bill on a party-line vote of 31-23 after more than 27 hours of debate. The Ways and Means Committee approved the legislation early Thursday morning. The bill will next go to the Budget Committee, where it will be finalized before a full House vote. But while President Donald Trump, who favors the legislation, and other GOP leaders are convinced this will lead to the repeal and replacement of President Barack Obama's signature healthcare law, Democrats, some Republicans and many healthcare organizations have said they would fight to prevent loss of coverage for up to 30 million Americans. "This is decisionmaking without the facts, without the evidence," House Minority Leader Nancy Pelosi told reporters, referring to the lack of hearings or expert witness testimony. A national association representing hospitals — major employers in many districts — wrote lawmakers complaining about the bill's cuts in Medicaid and other programs. It said the bill is likely to increase the number of uninsured Americans, adding, "We ask Congress to protect our patients." Groups representing public, children's, Catholic and other hospitals also expressed opposition. Medicaid was the focus of the second day of markups in the Energy and Commercy Committee. The discussion centered on whether the program should be changed to a per capita cap system. Under the House Republicans' proposed per-capita grant model, starting in 2020 states would receive a fixed amount of federal money for each of five beneficiary groups. Then they'd have to decide who to cover, what benefits to offer and how much to pay providers. Around 4:30 a.m., an amendment was offered by the committee's ranking member, Rep. Frank Pallone (D-N.J.), to strike the per-capita caps section from the GOP repeal bill. The amendment was defeated among party lines, 31-23. “This fundamentally guts the financing structure of the Medicaid program by limiting federal payments to states, leaving states to decide whether to raise taxes, cut payments to providers, reduce benefits or cut eligibility,” Pallone said. An amendment from Republican Reps. Joe Barton of Texas and Marsha Blackburn of Tennessee to freeze enrollment for the Medicaid expansion by year-end was not even voted on before the panel sent the bill out of committee. The measure would prevent people with incomes up to 138% of the federal poverty level to join the program after Dec. 31. After hours of debate, Republicans were ready to get the bill out of committee. As the AHCA reads now the freeze on new Medicaid expansion enrollment would not hit until the end of 2019. It's unclear if the amendment will be reintroduced at a later point. 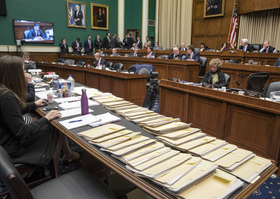 The Republican Study Committee, a conservative group of around 170 House Republicans, endorsed the amendment Thursday morning. The move surprised some in political circles as RSC rarely publicly endorses amendments on pending legislation. Fitch Ratings, a global credit rating agency said Thursday that the Medicaid provisions of freezing enrollment and capping funding would have a negative impact on insurers offering managed-care plans. “For the small number of rated health insurers that derive a significant proportion of their revenues from providing Medicaid products to states, this could become a significant credit and rating risk,” Fitch said in a Thursday afternoon client alert. Even if the bill does ultimately pass the House, several Republican senators have said they will vote "no" on the bill because of Medicaid expansion. Sen. Tom Cotton (R-Ark.) tweeted Thursday morning that House Republicans needed to “pause, start over. Get it right, don't get it fast." Cotton's state is one of the 32 including the District of Columbia that expanded Medicaid.